And here is the summary of my talk, as ably interpreted and tweeted live by the event reporters (Isla & Ben of Article magazine). An impressive job. “Luke Bennett’s presentation focused on the theme of the past tense of work. Sheffield as a “working” city and the possibilities of reading the landscape to combine the different points of view from the eyes of the law, the social and the pedestrian and history as a system of accreted surfaces. Luke uses his blog to question these themes, through wandering and wondering- are these activities of work, labour and production? A way in which places are made by our work practices- realm of on site practice and their materialities. Luke is both an environmental lawyer and a social researcher – wanting to blend the different ways of reading and engaging with the city, the reality physicality of city-process carried out by lawyers, surveyors and inhabitants- all read through the concrete of the city and its ghosts. The materialities are undeniable in the city and its uses, yet much is passed unnoticed until the human element engages with it- in a crack that causes destruction or accident that would otherwise be disengaged with. Luke is fascinated by valorization of mundane elements of the built environment- tracing psychogeography, urban exploration and play. Luke urges us to notice the ghosts of the present and their fear of usage/non usage/liabilities/compliance, the ghosts of the future- forward gazing/ contingencies/planning/designing – how are we going to do it?/afford it?- and the ghosts of the past, a not fully known past always haunting the present and future. We all see the concrete from partial cultural standpoints that shape how we see the places that we use. Getting to the science of the matter, Luke was here to investigate why we see and notice what is noticed and not noticed in the landscape and want to bring these together. To blend and explore the intersection of multiple – heterogeneous- perspectives, from legal scholarship: deductive, hermetic-study as code-system, social science- inductive/ generalisations- (make claims to “scientificness”), and the arts- phenomenonological- specificity of one thing looking at rather than code/general. Luke works “towards a psychogeography of the dropped curb”- what is missing is a sense of the mundane shaping force of law- adding the concrete and combining the ghosts. To “trace the humdrum within the spectacular” through noticing everything- from all angles and doing something with the outcome. 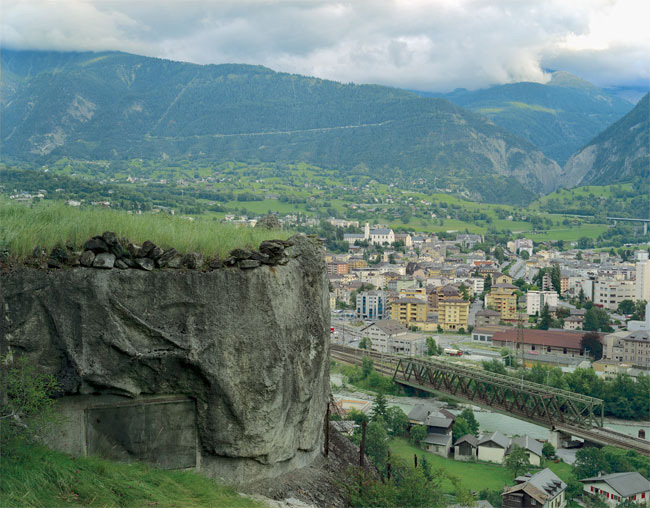 The photo above is from http://www.laboiteverte.fr/en/les-bunkers-suisses/ where there are a number of instances of bunkers disguised as mountain outcrops. 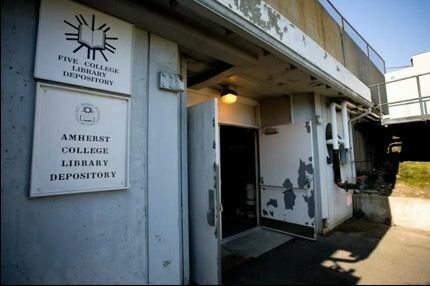 Please excuse the self-quotation here – but it’s a good launchpad for looking at an interesting issue underlying Amherst College’s co-option of the former military bunker that it has been using for book storage since 1994. The bunker was created by hollowing out part of the Holyoke Range, to create a backup battle centre for the U.S. Strategic Air Command. If its central base in Omaha had been destroyed, control of nuclear warfare would have switched to Amherst. 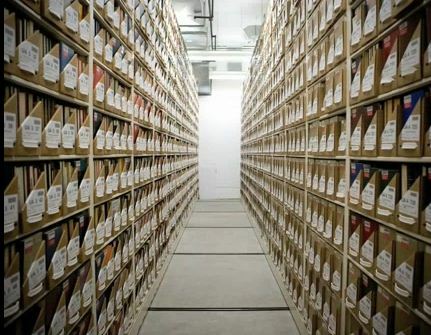 What strikes me is that the absence of a physical system of arrangement to separately categorise and organise the stock of the books (other than via size) places total reliance on the electronic catalogue to give that collection meaning (i.e. any purposeful interrogation and retrieval faculty). 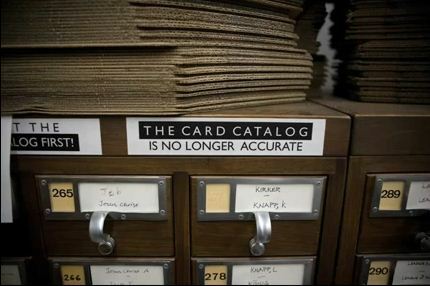 If the electronic catalogue were to become lost, then this stock of knowledge would lapse to amorphous shelved heaps of data. With thanks to Martha Bridegam for pointing me in the direction of this bunker. Battle, M. (2003) Library – an unquiet history, William Heinemann: London. New uses for old bunkers #11 – what’s the first thing you do after moving house…? So you’ve just moved to a new town. You have a young family, unpacking and home-making to attend to. What do you do first? Excavate the Anderson Shelter you’ve stumbled upon at the bottom of your new garden? I’ve just come across a fascinating blog by Stephen Geraghty in which he enthusiastically recounts – blow by blow – the discovery and excavation of his very own air raid shelter shortly after moving into his new home. He’d found a mound at the bottom of the garden whilst looking for somewhere to dump some rubble. He took an interest and set to work digging. He unearthed the shelter and – when it was too dark to dig – provided the world with progress updates on a blog set up for the purpose. First, I get it – and his blog is a great read. It wonderfully captures the way in which you can become gripped by an urge to see a task through, especially the urge to uncover something. Applied to this 36 year old male human, perhaps the urge to uncover this bunker loomed into view and blocked out the raw heat of the 1000 things requiring his urgent attention back in the day to day domestic world. And thirdly, it reminds me of an article of mine that will shortly be published in the academic journal, Gender, Place and Culture. In that article I look at the gender bias in bunker hunting, specifically the question “why is it mostly blokes who have these urges?” Amongst a number of avenues that I explore in the article is an attempt by me to look upon bunkers as shed-like, the potting shed being the classic male refuge. In my article I take issue with Smith on some of these points, but for now we will leave Stephen to his shelter. Around this time last year my son and I took a trip to London to visit the Titanic artefacts exhibition at the O2 arena. Each of us was rather underwhelmed by that experience. We had a few hours to spare, so went for a stroll along the rather battered coast path that leads down to Greenwich proper. For me the walk was, in part, inspired by Christian Nold’s sensory mapping of the peninsula, in which he’d used biosensors to plot the emotional recall of residents wandering this zone. I wondered what we – as ‘out of towners’ would find. My son probably wondered that too (but without the theory bit). On a desolate strip of wharfage, a demolition site behind, with the sound and smell of bricks being ground back into dust, we came upon some abandoned sections of precast concrete tunnels. They were just sitting there. Scattered like discarded kids’ building blocks. But these tunnel sections were each van-sized. There was a crane nearby, and a slightly unnerving instruction to venturers to these parts that they should await the handsignals of the operator before proceeding further along the path. I wondered what arcane signals he might use to communicate crane-speak to me, but sadly the cab was empty. We lingered here for quite a while, each of us inspecting these tunnel sections. Each for our own reasons. He because he’s young enough to still find graffiti and swear words exciting and shocking. Me because the urban art with which these tunnel sections were festooned was not all recent. By my guess, many of these words and images were inscribed here in the mid 1980s. The youth of today don’t seem to invoke Charles Manson in the way that he was paraded around as an icon of the ‘alternative’ back in the day. And seal clubbing doesn’t seem to get much of a look-in to public discourse either nowadays. These concrete sections thus reeked for me of a certain ’80s counter-culture. Triggering a partial nostalgia, but also a realisation that things come and go (but leave behind some traces). And then I spotted the rats. The sprayed on rats. Small and down in a corner. 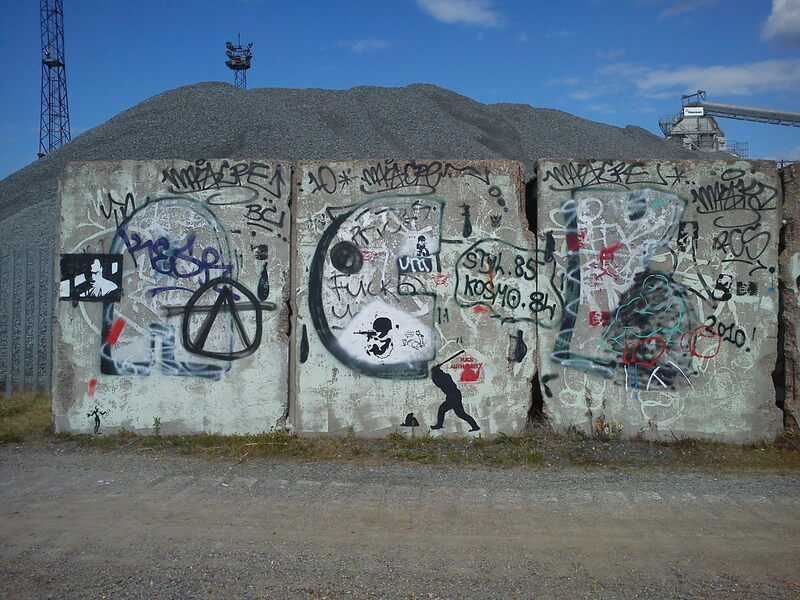 But looking very much like Banksy rats. This concrete array then seemed stranger. Like some alien art-ship that had crash-landed here or the skeletal hulk of a tattooed cement whale, who had lost his way in a worm-hole sometime in 1986 and ended up stranded here. In the course of preparing for a talk I’m giving on metal theft later this week I’ve stumbled upon a rather interesting conjunction of the sacred and the profane. Theft of lead from church roofs has hit the Church of England and its main insurer, Ecclesiastical, very hard recently: in 2011 an estimated £10million for the CofE and £4.5million for its insurer (via 2,500 claims). This claim rate tops the level reached at the height of the pre-credit crunch metal theft wave (2,400 in 2008). With over half of Britain’s Grade I listed buildings on its books, the church’s insurer has recently launched a campaign to show how lead theft from church roofs might be best deterred. But what grabbed my attention the most was the suggestion that the alarm system could be characterised as ‘the voice of God’. You get a brief glimpse of this effect in Ecclesiastical’s video. A creeping figure prowling the shadows of the churchyard. Shinning up onto the roof via a carelessly unsecured wheeliebin. A few moments later the trumpets of Jehovah ring out (well an electronic alarm) and a recorded message (a deep-ish voice but more likely New rather than Old Testament in tone) booms out, warning the would-be thief that this premises is aware of him. That the church has sensed his presence, and is summoning human assistance. That the eye of an omniscient observer is upon him. I’d love to hear the full message and watch CCTV of how mortals react to this spiritual ambush.